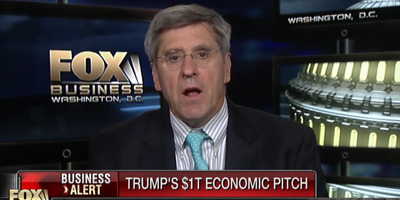 Screenshot, YouTubeThis is Stephen Moore. He likes tax cuts. Moore said the repeal of the state and local tax deduction, new taxes on universities, and the repeal of the so-called individual mandate in particular targeted liberals. Stephen Moore, one of the top economic advisers to Donald Trump’s presidential campaign, on Tuesday said the new Republican tax bill would hit one groups of Americans especially hard. “It’s death to Democrats,” Moore told Bloomberg’s Sahil Kapur. Moore, a conservative economist, pointed to provisions that would repeal the state and local tax deduction – which is used heavily in the high-tax states New York and California – and new proposed taxes on large universities as examples of provisions that go after liberals. Moore also wrote an op-ed article published Tuesday saying the increase in taxes for “blue states” in the bill – the Tax Cuts and Jobs Act – should be blamed on liberals in those states. Moore also said tax cuts would come for everyone, even wealthier Americans. But he said they would not specifically help the wealthy more than the middle class, citing an analysis by Chris Edwards at the libertarian Cato Institute. He said every American should fight for the tax bill to be passed. “You want to kill the economy – and Christmas? Follow Chuck Schumer and Nancy Pelosi’s advice and kill the tax cut,” Moore wrote. Other analyses by the nonpartisan Tax Policy Center and the Joint Committee on Taxation, the official government scorekeeper, have shown that over time more and more of the bill’s benefits go toward wealthier Americans, while many middle-income Americans could face tax increases.